The trailer for Warrior gives the movie the air of another-The Fighter. The comparison is quite natural; both films appear, ostensibly, to be about fighters in a ring. But for many reasons Warrior cannot be equated with the excellent The Fighter. Tess (Jennifer Morrison) with her husband, Brendan (Joel Edgerton), discussing the idea of him fighting again. 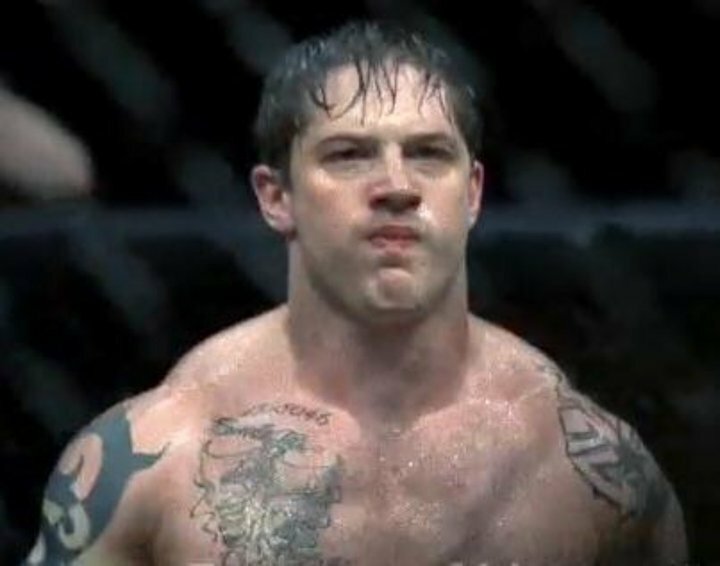 Warrior is about two estranged and very different brothers, Brendan (Joel Edgerton – Animal Kingdom, Wish You Were Here, Zero Dark Thirty) and Tommy (Tom Hardy – Bronson, Tinker Tailor Soldier Spy, This Means War), who compete in a mixed martial arts competition. Brendan is a former fighter, but now married to the pretty Tess (Jennifer Morrison – Mr. & Mrs. Smith, Star Trek, Knife Fight), and a high-school teacher by trade. He and his wife are struggling with debts, and the bank is threatening to evict them from their home. Such is their plight, Brendan hires a personal trainer, Frank (Frank Grillo – Minority Report, Mother’s Day, End of Watch), and returns to the ring to make some money. Tommy enters the competition for different reasons. Tommy has returned home from army duty in Iraq, and needs to be cleaned up from his pill-taking, alcoholic lifestyle. Using his now-sober father, Paddy (Nick Nolte – The Thin Red Line, Hotel Rwanda, The Gangster Squad), who was a boxer in his day, as his trainer, Tommy gets in shape for the competition. Whilst simple, Warrior’s plot is (painfully) slow. The film is 140 minutes long, and it could feel a lot longer for those who become bored with the movie’s sluggish pace. Also, the last hour becomes predictable and cliché. Some thought that The Fighter became ‘too Hollywood’ by the end. There might be some truth in that; nevertheless that movie is based on a true story, so it cannot, to an extent, be helped. This is not the case for Warrior, meaning it has no excuse for becoming cliché. Brendan making his comeback in the ring. Moreover, there are inconsistencies in the storyline, which become ridiculous during the fighting scenes. The background of the main characters, despite being hinted at often, is also (irritatingly) not explained. By the end of the movie, one is no closer to understanding why the brothers became estranged from each other, and their father. Warrior’s storyline may have its flaws, but the dialogue is very well written and feels realistic. This is aided by the main actors delivering strong and convincing performances. As Brendan, Joel Edgerton does a fine and consistent job, playing a level-headed and resilient man, despite his understandable stresses. No-one would realise that Edgerton is Australian either from this performance, as his soft Pittsburgh accent remains intact throughout the film. Similarly, no-one would know that Tom Hardy is English from Warrior. As Tommy, Hardy admirably plays a troubled, insecure and aloof individual, who gets through his days by drinking and taking drugs. Tommy may not be a kind character, but the way he walks with his head down, and the dark circles under his eyes are indicative of his internal difficulties. It is a shame for Hardy (and Edgerton for that matter) that their characters’ backgrounds are not dealt with, because that would have, perhaps, enhanced their respective characters from two-and-a-half to three dimensions. Furthermore, for Hardy, playing a drug addict draws (unfair) parallels with Christian Bale’s Oscar-winning performance in The Fighter. In this proxy fight before they go head-to-head in The Dark Knight Rises, as Bane and Batman, respectively, it is the latter who comes out on top. This is because Hardy has a less-challenging role as the lazy, slurring stoner, whilst Bale played the demanding crazy, brimming-with-energy crack addict. The leading actors give worthwhile performances in Warrior, and the same can be said for the supporting cast, particularly Nick Nolte and Jennifer Morrison, even if they vary slightly in quality. Nolte, playing a reforming alcoholic who has found Jesus, plays very well when on screen. When he shows emotion, one does genuinely empathise with Paddy’s predicament (even if he has brought most of his problems upon himself). Surprisingly, one does not feel similarly vis-à-vis Morrison’s character, Tess. This is partly because Tess has not been given much personality, and because Morrison doesn’t make one feel the desperate nature of Tess’s situation. The younger brother, Tommy (Tom Hardy), at the tournament. His muscular frame suggests that he’s ready to take on anyone. Lastly, director Gavin O’Connor (Tumbleweeds, Miracle, Pride & Glory) has put Warrior together quite well. The scenes flow smoothly one after the other, but the choice of music is perplexing. For much of the first half of the film, there is little music (which is fine); yet, the second half is filled with a bizarre mix of standard boxing music and a Beethoven symphony. Beethoven and martial arts are a curious mix. All-in-all, Warrior is an agonisingly slow film and pitiably cliché. It has acting of great quality, but by not elucidating upon the characters properly O’Connor misses the chance for his movie to be potentially nominated for awards. The Fighter had no such deficiencies. One nil to Batman.